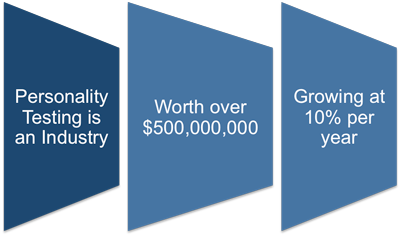 In 2012, personality testing is a $500 million industry which has been expanding by about 10% per year. There are currently well over 2,500 personality questionnaires on the market and each year dozens of new companies appear with new products. Some of these products are broad-spectrum tests designed to classify basic personality types, some are designed to test candidates for suitability for a particular job and some are designed to test for particular traits – for example, honesty and integrity. Many of the well established companies who provide tests do operate to the highest ethical and professional standards. However, in 2009 this market should be seen for what it is. One with low barriers to entry and that is very poorly regulated. Anyone can set up a company to develop and sells these tests and can make whatever claims they feel like, secure in the knowledge that they are very unlikely to be challenged. Some of the companies that produce personality tests are very secretive about their methodologies and do not make public crucial information about how their tests were developed or how well they work, claiming that this information is ''proprietary." Despite the claims of test producers, it is very easy to cheat. Certainly, most tests contain some so-called impression control questions, designed to catch out candidates who are trying to give an overly good impression. This is one of the areas where the claims of the test producers and common sense are at odds. After all how difficult can it be with a little practice, to spot these questions when most tests consist of less than 150 questions in total. This is supported by a study conducted by the American Psychological Association which found that over 80% of job applicants actually hired after taking a widely used personality test had intentionally manipulated their answers to make themselves look better. Critics of personality tests would argue that they present people with an unpleasant choice: Lie a little, or lose a career opportunity to someone who's willing to do so. How much you choose to try and influence the resulting personality profile is something only you can decide. Common sense would suggest that you should not attempt to influence the results too much as they will probably be seen to conflict with your past achievements and with how you are perceived at the interview. The best approach is probably to take the time to understand how these tests try to measure your personality and then to make sure that you don't allow any aspects of your personality to be perceived as inappropriate for the job. Are HR Departments Skeptical Enough? Firstly, almost all CEO's and senior board members have a background in finance, technology or marketing. It is unusual to find someone who has risen to this level from within human resources. This means that HR rarely has powerful advocates at the top level within organizations. Secondly, most of the jobs in HR, or personnel departments as they were known until the mid 1980s, are at the administrative level. Few HR staff have university degrees compared with IT for example, where very few staff are not university graduates. Thirdly, despite platitudes like ‘people are our most important asset’, companies invariably see HR as a cost center rather than a profit center. These factors mean that HR has traditionally been the first department to feel the effects of cost-cutting when times get tough. Jobs within HR are almost always the first to go. This is partly because the company is no longer recruiting, but also crucially because HR people are, probably unfairly, seen as relatively easy to replace. Unsurprisingly, many HR people have been keen to latch onto something that gives a scientific or technical aspect to the HR function. Personality questionnaires do this very well as they are seen to give the notoriously subjective selection process some objective and scientific credibility. Even the most purely motivated HR people probably don’t have a background in psychology, which means that very few are qualified to make objective judgments about how personality questionnaires should be used. Most will be relying on the salesmen employed by the companies who produce the tests to tell them.